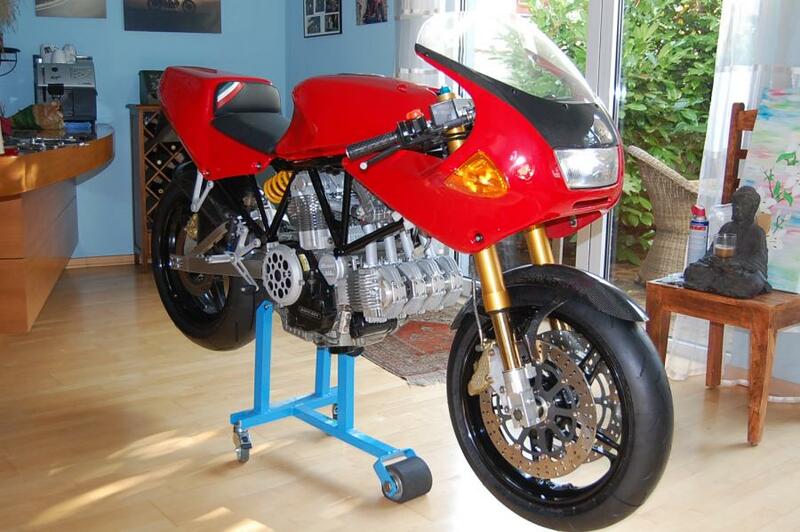 How do you like a L-Twin Ducati? Well, that is rather a really silly question really, as who on earth would not love a Ducati L-Twin? 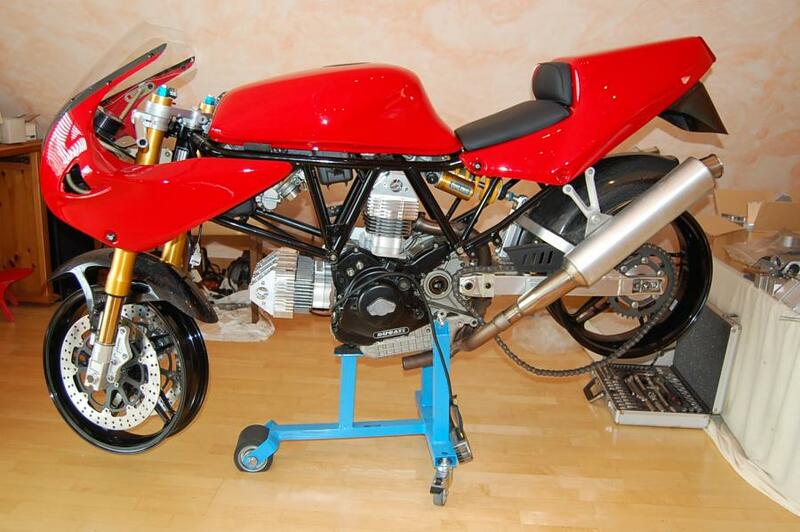 So, how about a Ducati L-4 like the awesome Desmosedici RR? Of course, probably none of us reading this blog has even set atop the Desmosedici. But nonetheless, doesn’t just the idea of sitting atop a 4 engined Ducati give you the goosebumps, right! And so, then how about a L-8 Ducati? Yes, yes, like you know 2 Desmosedici in one… And no neither am I out of my mind and nor am I kidding. 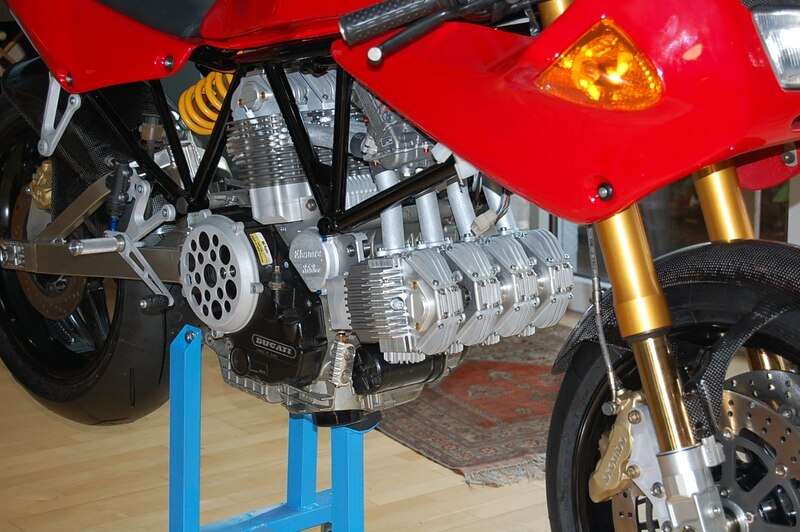 So how do you get or have or acquire a Ducati with 8 engines? Of course, Ducati has never tried it on any prototypes either but that hasn’t stopped a German gentleman who just went ahead with this crazy idea and has made a Ducati L-8. In Ducati language, the number 16 has quite a big relevance. In Italian sedici means 16. 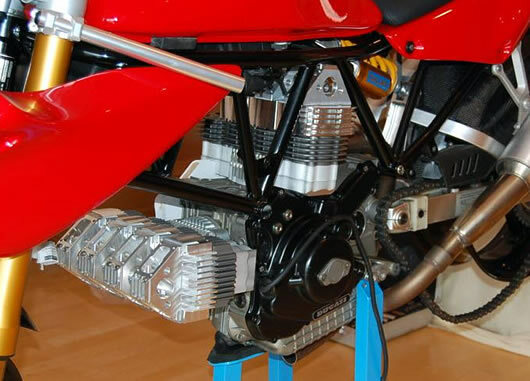 And in Ducati language, when you say Sedici, it usually refers to the Desmosedici as the 4 cylinders have 4 desmodromic valves each, totaling 16 valves and that is the reason it is called Desmo – Sedici. This particular German gentleman took the same language instructions but gave it a totally new perspective since he has 2 valves in each of the 8 cylinders and so that too makes 16 valves. And that is how you make an L-8. Dieter Hartmann Wirthwein’s is the name of that man and his innovative Ducati L-8 has its first public showing at the Intermot 2010 show. 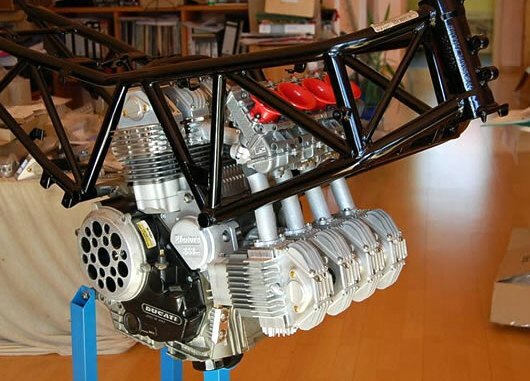 The L-8 engine is fitted to a 900SS rolling chassis. The bike has been on the news since a year back and there were quite a few skeptics who though this would probably never make it. 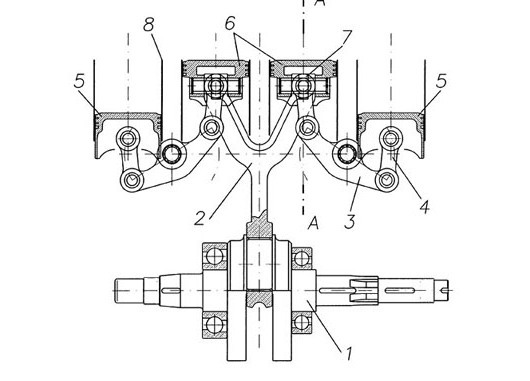 But within the last 12 months, Mr. Wirthwein has completed the patent application process for his innovative connecting rod scheme that allows an original 900SS crankshaft to be used and consequently the powerplant can fit in a 900SS frame. I believe it is not fully ready to try it out on the roads or tracks. 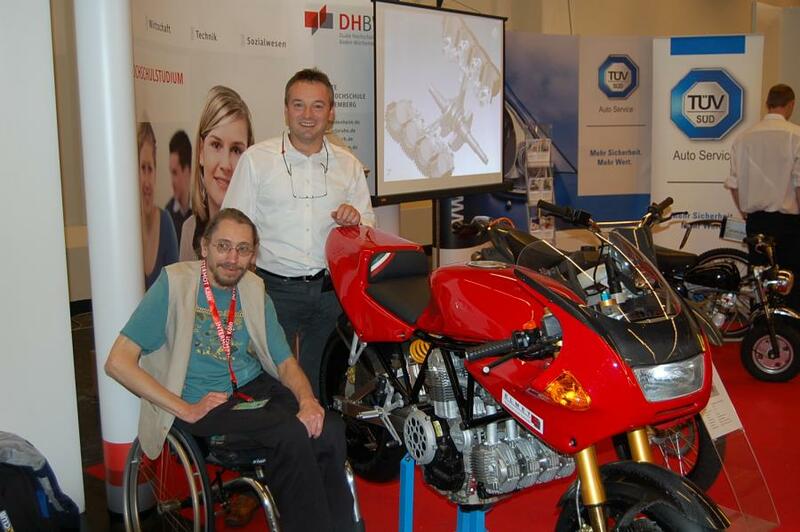 Anyway, the world officially took notice of the bike at this year’s show in Cologne, Germany. 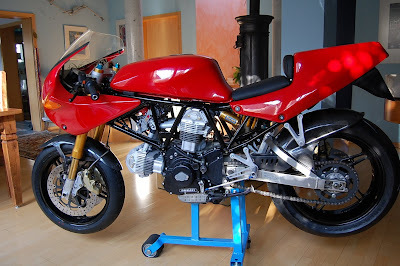 Imagine the sound of any Ducati L Twin and now imagine what 4 Ducatis would sound like, all at sync! I haven’t been able to find any video of the bike on run but I am sure the sound would be absolutely awesome. The only video I found related to this bike is a diagrammatic representation of how the connecting rods would work. Here is the link. Surprisingly, the valve actuation is not desmodromic.This German engineer is of course and has to be a Ducati fanatic. And if you look at his website, there are quite a few interesting projects of Honda, BMW and Bultaco up his sleeve. You might like, actually try it, you will most definitely like his ‘Monkey’ project. 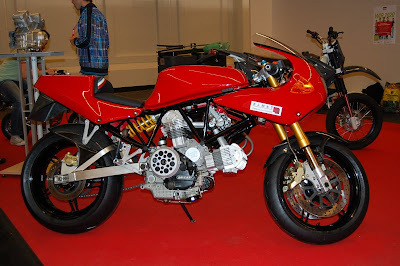 He has named this Ducati bike as ‘Elenore’ of course meaning 8 referring to the cylinder numbers. 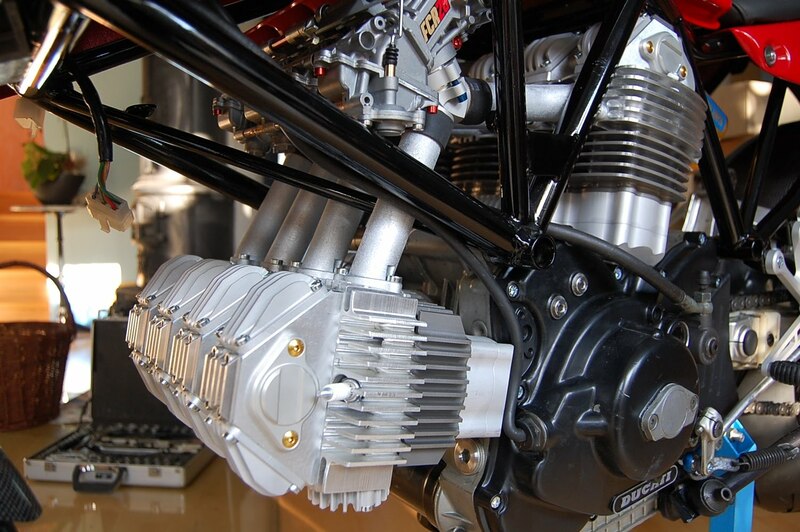 The engine uses cylinders with a bore and stroke of 56 and 44mm respectively for a total capacity of 868cc. There are not much details on his website or anywhere else, so in case you come over more information, please share. The time line for this project is by the end of the year by which time, it will be fully functional and we can listen to its roar. As per the specifications, the bike has a good compression ratio of 11:1 and that would be helpful for a relatively low power output of 80 bhp strictly speaking in Ducati lingo. Anyway, we can surely wait for a month more and let Wirthwein do his magic in the mean time and I am sure we will be quite happy with the final product if the production stage gives any indication. His workshop is in Rimbach, Germany (Staatsstrasse 51, 64668 Rimbach).You can visit his website, for some additional info and pictures. You can also contact him through email or phone (06253 238488) to learn more about his projects.